In this April 4, 2012, photo, Kelly Andrus plays with her son Bradley, in his classroom at Children's Choice Learning Centers Inc. In this April 4, 2012, photo, Kelly Andrus holds her son Bradley in his classroom at Children's Choice Learning Centers Inc., in L In this April 4, 2012, photo, Kelly Andrus follows her son Bradley as he runs through a classroom at Children's Choice Learning Ce In this April 4, 2012, photo, Kelly Andrus holds her son Bradley in his classroom at Children's Choice Learning Centers Inc., in L In this April 4, 2012, photo, Kelly Andrus follows her son Bradley as he runs through a classroom at Children's Choice Learning Ce In this April 4, 2012, photo, Kelly Andrus plays with her son Bradley, in his classroom at Children's Choice Learning Centers Inc.
Chicago • One child doesn't talk, rocks rhythmically back and forth and stares at clothes spinning in the dryer. Another has no trouble talking but is obsessed with trains, methodically naming every station in his state. Autistic kids like these hate change, but a big one is looming. 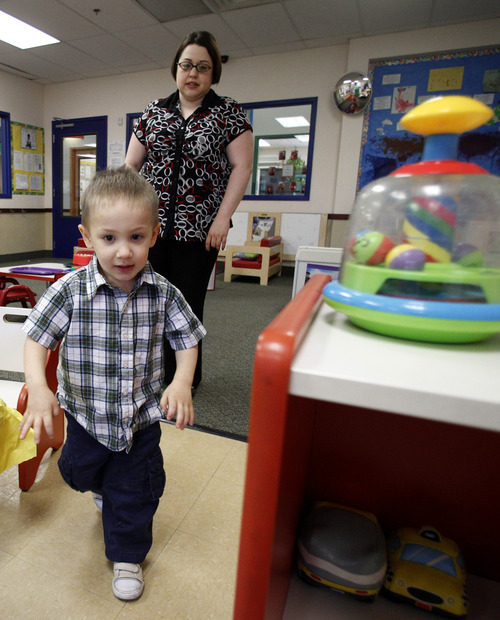 For the first time in nearly two decades, experts want to rewrite the definition of autism. Some parents fear that if the definition is narrowed, their children may lose out on special therapies. For years, different autism-related labels have been used, the best known being Asperger's disorder. The doctors working on the new definition want to eliminate separate terms like that one and lump them all into an "autism spectrum disorder" category. Some specialists contend the proposal will exclude as many as 40 percent of kids now considered autistic. Parents of mildly affected children worry their kids will be left out and lose access to academic and behavioral services  and any chance of a normal life. But doctors on the American Psychiatric Association panel that has proposed the changes say none of that would happen. They maintain the revision is needed to dump confusing labels and clarify that autism can involve a range of symptoms from mild to severe. They say it will be easier to diagnose kids and ensure that those with true autism receive the same diagnosis. With new government data last week suggesting more kids than ever in the U.S.  1 in 88  have autism, the new definition may help clarify whether the rising numbers reflect a true increase in autism or overdiagnosis by doctors. There is no definitive test for autism. The diagnosis that has been used for at least 18 years covers children who once were called mentally retarded, as well as some who might have merely been considered quirky or odd. Today, some children diagnosed with autism may no longer fit the definition when they mature. "We're wanting to use this opportunity to get this diagnosis right," said Dr. Bryan King, a member of the revision panel and director of the autism center at Seattle Children's Hospital. The revision is among dozens of changes proposed for an update of the psychiatric association's reference manual, widely used for diagnosing mental illnesses. The more than 10,000 comments the group has received for the update mostly involve the autism proposal, with concerns voiced by doctors, researchers, families and advocacy groups. A spokeswoman declined to say whether most support or oppose the autism revision. The group's board of trustees is expected to vote on the proposals in December, and the updated manual is to be published next year.  A new "autism spectrum disorder" category would be created, describing symptoms that generally appear before age 3. It would encompass children with "autistic disorder," now used for severe cases, plus those with two high-functioning variations. A diagnosis would require three types of communication problems, including limited or no conversation and poor social skills; and at least two repetitive behaviors or unusual, limited interests, including arm-flapping, tiptoe-walking and obsession with quirky topics.  Autistic disorder and high-functioning variations  Asperger's disorder and PDD-NOS, or "pervasive developmental disorder not otherwise specified"  would be eliminated, but their symptoms would be covered under the new category. Asperger's kids often have vast knowledge about a quirky subject but poor social skills; PDD-NOS is notoriously ill-defined and sometimes given to kids considered mildly autistic.  Another new category, "social communication disorder," would include children who relate poorly to others and have trouble reading facial expressions and body language. A small percentage of children now labeled with PDD-NOS would fit more accurately into this diagnosis, autism panel members say. They say the changes make scientific sense and are based on recent research. Opponents include older kids and adults with Asperger's who embrace their quirkiness and don't want to be lumped in with more severe autism, and parents like Kelly Andrus of Lewisville, Texas. Her son, Bradley, was diagnosed with mild autism a year ago, at age 2. "I'm really afraid we'd be pushed out of the services we get," she said. That includes a free preschool program for autistic kids and speech and occupational therapy, which cost her $50 a week. The family has no medical insurance. Opponents also include a well-known Yale University autism researcher, Dr. Fred Volkmar, who was on the revision panel but says he was unhappy with the process and quit. "I want to be sure we're not going to leave some kids out in the cold," he said. Volkmar is senior author of a study suggesting that the revision would exclude nearly 40 percent of children with true autism. But members of the revision panel have challenged Volkmar's methods, saying he relied on outdated data from two decades ago. One major advocacy group in the field, Autism Speaks, said it is awaiting further research on the effects of the revisions before deciding whether to endorse them. Dr. James Harris, a panel member and founding director of the developmental neuropsychiatry program at Johns Hopkins University, said the proposal will provide a better label for children who really only have communication problems. "I don't want a child labeled as autistic, which suggests a chronic, lifelong problem, when he has a social communication problem that may get better if he has proper services and his brain matures," Harris said. Harris said these kids don't need intensive autism therapy but should be eligible for other types of special education typically offered in public schools. Dr. Daniel Coury, chief of developmental and behavioral pediatrics at Nationwide Children's Hospital in Columbus, Ohio, said parents have valid concerns because insurance companies and schools may not immediately recognize that children receiving the new diagnosis may need special services. "So there may potentially be a lag time where services would not be available," he said. A new "autism spectrum disorder" category would be created, describing symptoms that generally appear before age 3. It would encompass children with "autistic disorder," now used for severe cases, plus those with two high-functioning variations. Autistic disorder and high-functioning variations  Asperger's disorder and PDD-NOS, or "pervasive developmental disorder not otherwise specified"  would be eliminated, but their symptoms would be covered under the new category. Another new category, "social communication disorder," would include children who relate poorly to others and have trouble reading facial expressions and body language. A small percentage of children now labeled with PDD-NOS would fit more accurately into this diagnosis, autism panel members say.